The government's response to child abuse linked to witchcraft would have been different if it involved mainly white children, it has been claimed. Eleanor Stobart, who wrote an official report on the problem, told the BBC the government's response to some of her recommendations had been lacking. It follows witchcraft-linked cases where African children were abused. The government said it accepted all Ms Stobart's recommendations and it had stepped up action to tackle such abuse. The Department for Education and Skills said it had already put into place a comprehensive, cross-agency strategy to deal with the problem. The government-commissioned Child Abuse Linked to Accusations of Possession and Witchcraft report examined cases of abuse which occurred since January 2000. It said belief in witchcraft within UK African communities was widespread but that the number of child abuse cases as a result was small compared with the overall figure. The report identified 74 cases of abuses linked to witchcraft allegations, many of which had common factors - such as a child being scapegoated, family structure and disability. Speaking to BBC Radio 4's Today programme, Ms Stobart said: "Their carers and parents truly believed that they were possessed and that they were harbouring evil spirits. "When it was attempted to rid the child of the evil spirit then the children received beatings - they were cut and stabbed. "Some were burnt with implements such as irons. Chillies were rubbed in their eyes." Ms Stobart made five main recommendations - all accepted by the government - which included maintaining a central record of child abuse cases linked to witchcraft allegations and to encourage the preparation of "good practice" guidelines by agencies in the field. "Social workers and other professionals don't recognise how serious an issue this can become," Ms Stobart said. "My understanding is that we really need to develop further more in-depth guidance for professionals." Ministers had not spoken to her about how the recommendations would be implemented, she said. She said the "response of a lot of people would be different" if the cases had involved "mainly white children". "I think that many issues that affect black and minority ethnic communities are not as well addressed as they might be and that includes issues around possession and witchcraft." More work needed to be done, she added. 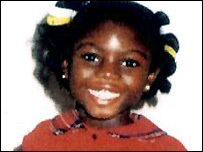 Court cases linked to witchcraft include that of eight-year-old Victoria Climbie, who died after suffering serious cruelty and neglect, including being beaten, burned with cigarettes and forced to sleep in a bin liner inside an empty bath. Her great-aunt, Marie Therese Kouao, who was found guilty of her murder, told people Victoria "had demons inside her". Children's Minister Beverley Hughes told Today: "Because this is an emerging phenomenon, because of the beliefs behind this absolutely terrible abuse, it's very difficult for people in the UK to accept... I accept that. It was "not true" to suggest that the government's response would have been different if the majority of the children involved were white, she said. "The way in which we've responded, certainly since I became aware of this having been appointed minister, doesn't bear that out either. "I've completely accepted all of Eleanor's recommendations which include the recommendation that more extensive guidance dedicated to this issue should be published. "That's going to be done."